Even though the store is not cooperating we are still having fun and going along with our normal schedule of Technique Tuesday....but in my case it is more like Gift Idea Tuesday!! Yes, I'm back to offer ways of making fun stuff with Clearly Digi Stamps. 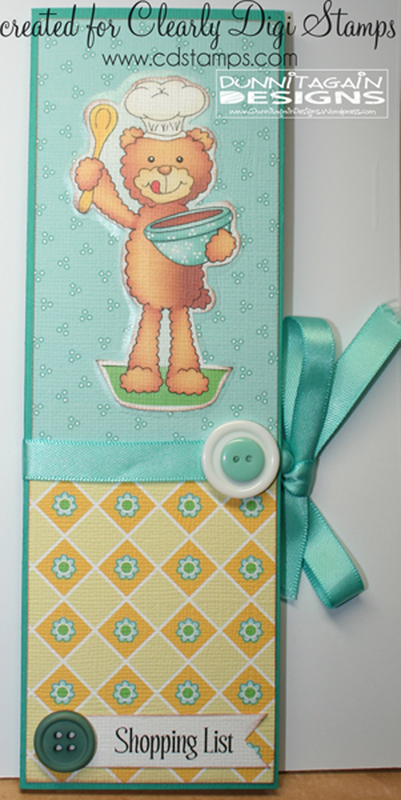 Today we are making CUTE notepads that will fit easily in your purse or can be given away as a gift. It is the end of the school year so I'm sure you have a gift list for teachers, bus drivers, graduates, etc. So hopefully you can cross a few people off the list by making a couple of these simple notepads. 1. Go to a local office supply store and have them cut the paper pads in half. 2. Cut your base paper (5 3/8" wide x 8" long) out of cardstock or double sided patterned paper. 3. Lay your pad of paper on the edge of the paper and make a pencil mark so you know where to score. 4. Score on your pencil mark and then 1/4 inch from that. 5. Decorate the front of the cover. I used Baking Bear Digital Stamp since I wanted this to be a shopping list note pad. This adorable digital paper is included in the stamp which made it super easy because everything already matched! *note* I ran the image through a Xyron sticker maker so the whole back is covered and hopefully the edges wont come up. I also used the laminate cartridge so the top is laminated and the bottom is sticky. 6. To put the ribbon on I cut slits in the front and back of the cover. This will keep the ribbon on the book even when it is untied. I used an x-acto knife and ruler. 7. Since the slit area isn't very pretty I decorated it to cover it up! 8. Now speaking of pretty we need to make the paper pad pretty! Cut a piece of paper that will cover the top of the paper pad. This paper pad is perforated so it will tear below where we are putting the pretty paper. 9. I used 1/2 inch scor-tape to place the patterned paper on the paper pad. 10. Now stick 1/2 inch scor-tape on the back of the paper pad so it can be adhered to the bottom of the cover. 11. Tie it together and your done!! Easy as that! Here are a few more examples! I cut this one wider to fit the pen on the right side. I would love to hear your thoughts on my gift idea! Oh and if you make some please leave me a link...I would love to see them. If you have any questions about this post please ask and I will do my best to answer. Don't forget to come back on Friday for a Special Digital Stamp Release and Challenge! Hi Kathy! It's Kathi from 613 Avenue Create...I didn't have your email to reply to your comment at the blog. Thanks for bringing the rules to my attention. They were in the right sidebar, don't know what happened to them! However, you may enter as many times as you like, no back linking, link to the post not the blog and provide a link back to the challenge. You know ...the usual rules :) All challenges are Anything Goes with a twist, you can use the sketch or not. You should definitely enter this project! This notepad has been on my "projects to make" list forever! LOL! I love how you tied yours with the ribbon and I especially like the teacher pad/pen set!! So, long story short, come join us! What a fun idea. Thank you for sharing the tutorial. I've done similar pads but never had one cut in half. What a great idea. I will see if Staples will do it. My cutter certainly wouldn't do it. Thanks for the inspiration! Really great idea. Thanks for sharing.